With the QNB-Mobile banking app, you've got "Your Community Bank" right in your pocket. Best of all, it's free*, secure, and easy to use! *QNB-Mobile is offered free of charge by QNB Bank. However, message and data rates may apply from your mobile service provider. **Eligible devices with compatible fingerprint or face scanners only. How do I make a deposit in the QNB-Mobile app? To make a deposit in the new QNB-Mobile app, tap the Menu button and select the Transactions tab. Then tap Deposit Check. If you have not yet enrolled in QNB-Mobile Check Deposit, you will have to tap the Services tab and then tap Mobile Check Deposit Enrollment. Once you've read the User Agreement and checked the "I accept the Terms and Conditions" box, tap the Accept button to become enrolled. For more QNB-Mobile Check Deposit FAQs, click here (PDF). 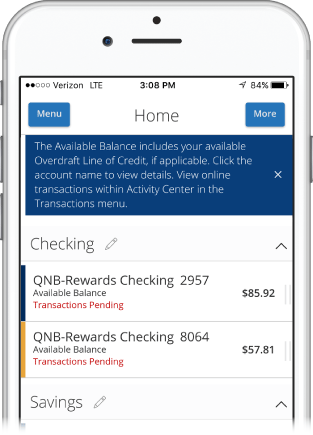 How do I pay bills in the QNB-Mobile app? Tap the Menu button. Then tap the Transactions tab and tap Bill Payment. If your account is not already enrolled, you will be prompted to enroll in Bill Pay. Tap on the payee and enter the information. (Choose the pay from account, enter the amount, choose the delivery method, and select the date that you want the payment to be sent.) Tap Send Payment to transmit your payment. If you are paying multiple payees, or need to make edits to your existing payees, tap on Advanced and select "Visit Bill Pay Site". This will bring you to the full Bill Pay site which not only allows you to make payments, but also allows you to edit information on your payees, etc. Enter the information for each payee that you wish to pay. (Choose the pay from account, enter the amount, choose the delivery method, and select the date that you want the payment to be sent.) Tap Submit All Payments to send your payments. How do I transfer funds in the QNB-Mobile app? Tap the Menu button. Then tap the Transactions tab and tap Funds Transfer. If you wish to set up a recurring transaction (optional), tap the Make This a Recurring Transaction checkbox. New input fields will appear, and you will need to specify the frequency and date range for this transaction. You can choose to make this transaction Repeat Forever by checking the box under frequency. When you have finished entering all of the needed information, tap Transfer Funds. If successful, a screen with an overview of your transaction will appear. All funds transfers will appear in the Activity Center (within the Transactions tab) whether immediate or future dated. You can view them at this time or tap Close and review at your convenience. How do I set up alerts in the QNB-Mobile app? Stay on top of your accounts by setting customizable alerts. Tap the Menu button. Then tap the Settings tab and tap Alerts. To create a new alert, tap the New Alert drop-down button. Choose the type of alert you wish to create from the drop-down list. A new screen will appear where you can enter the necessary information. Be sure to tap Save when finished. To view the alerts for each category, tap the category header. You can easily toggle an alert on/off without deleting the alert by tapping the Enable checkbox on the right side of the alert. To view or change details of an already-existing alert, tap the Edit link on the right side of the alert you would like to edit. Be sure to tap Save after you've changed your alert details. Where can I find the QNB-Mobile and QNB-Online disclosures?